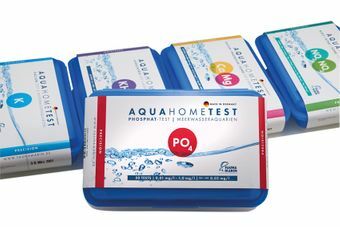 The Fauna Marin Phosphate Test is very high-resolution and can determine the phosphate concentration with a particularly high accuracy in the low concentration range between 0.01 and 1 mg/l. The Fauna Marin Phosphate Test is very high-resolution and can determine the phosphate concentration with a particularly high accuracy in the low concentration range between 0.01 and 1 mg/l with clear color recognition. Download Center Here we offer you a part of our operating instructions (HTU documents) for downloading. Order newsletter Want to amoung the first to hear about new products, sales and more? Subscribe to the Fauna Marin USA mailing list. © Copyright 2019 Fauna Marin GmbH. All right reserved.